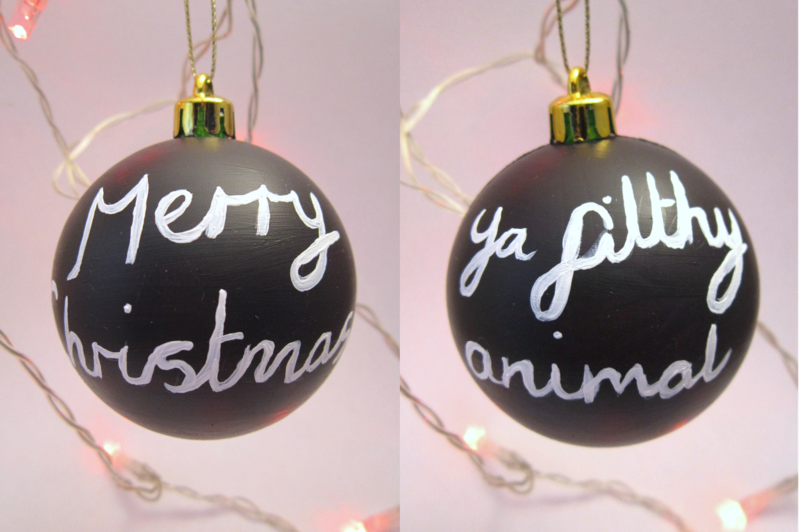 For fun I decided to make these Christmas movie quote baubles. Or Christmas moments in a movie, in the case of Mean Girls. Firstly, writing with paint and a paint brush is hard y'all! Especially when it's on a rounded surface. I'm not even sure this quote is in Home Alone, it might just be, "keep the change, ya filthy animal", but some store had made a jumper with the Christmas version on so if it was good enough for them, I'd go with it. Starbucks have started selling candy canes at the counter and when me and my friends saw them we came out with this quote from Mean Girls. Then a little while later when we were sat down we heard some girls do the same thing! 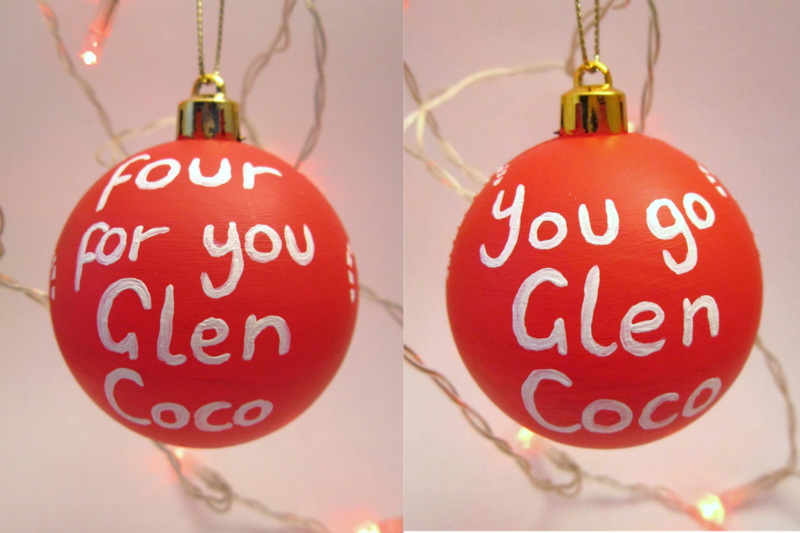 I painted some candy canes on the sides of this bauble, but you can't really see them in the photos. This one is my favourite. I'm really happy with the way I painted the letters. And I love the film Elf, and I do come out with this quote whenever someone mentions Santa. What are your favourite quotes from Christmas movies? ...have been a little under the weather with a stinkin' cold that's been slowing me down. But do you know what made me feel better? Finding out one of my best friends got engaged!! 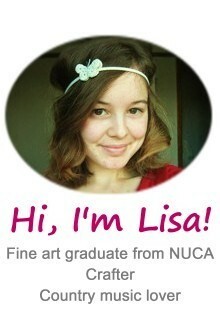 Lizzi is no stranger to the blog. You'll have seen her featured in a lot of my paintings. Last week she went on holiday with her boyfriend to New York and he popped the question. She announced it to us girls whilst out at Cafe Rouge and the people on the surrounding tables were startled for sure by the sudden screaming. We're so happy for our friend. 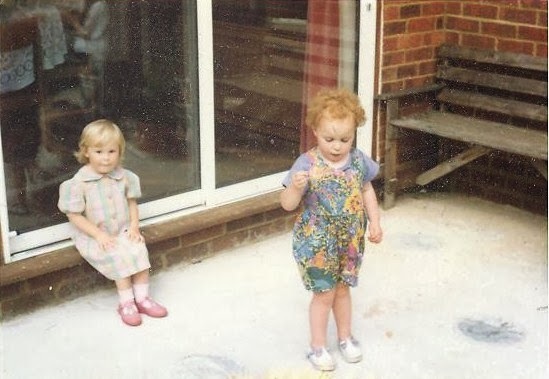 I didn't get a photo from that night - too much excitement and chocolate pudding - so I thought I would share this one of me and Lizzi at the start of our friendship. 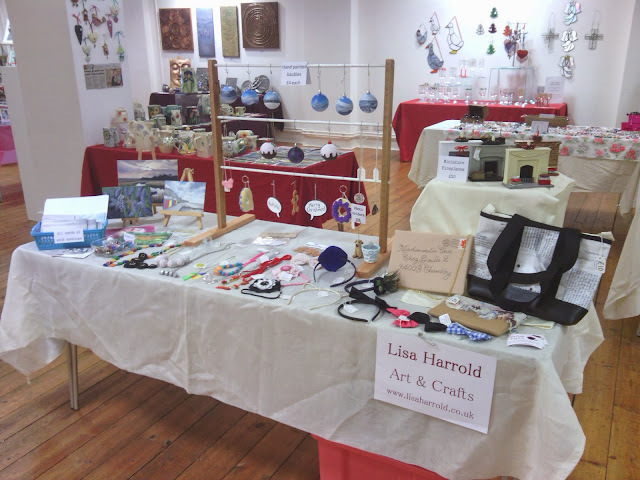 It's the Letchworth Arts Centre's Christmas Craft fair time again and my parents very kindly set up my table for me on Friday as I was working. I took this photo on Saturday and one item had gone already! These crochet Christmas lights were hung on the front of the table, but have since been sold. And on Saturday I went to see The Butler. I first heard about the film during Danny Strong's interview on Kevin Pollak's Chat Show which is my current go-to podcast. Has anyone seen the film? Did you notice Danny's cameo in it? I'm well and truly in Christmas mode and for this little project I was thinking of more alternative Christmas decorations. I was inspired by this plaque that I made many years ago and have hanging in my room. 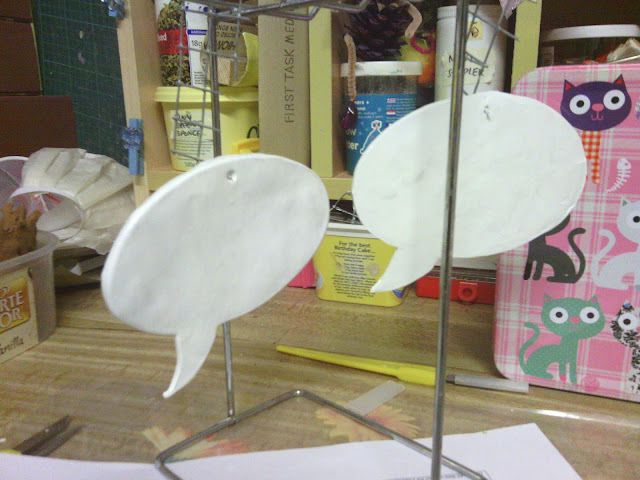 The hanging speech bubbles are made of Sculpey rolled flat and cut to shape. You can't really tell from the photos but they're about palm size. I painted them with white and black acrylic paint. I like the uneven black lines. I think it gives them character. That and I find it hard to paint smooth, straight lines. I think these would look really fun displayed on a Christmas tree but would also work as decorations for other parts of the house. 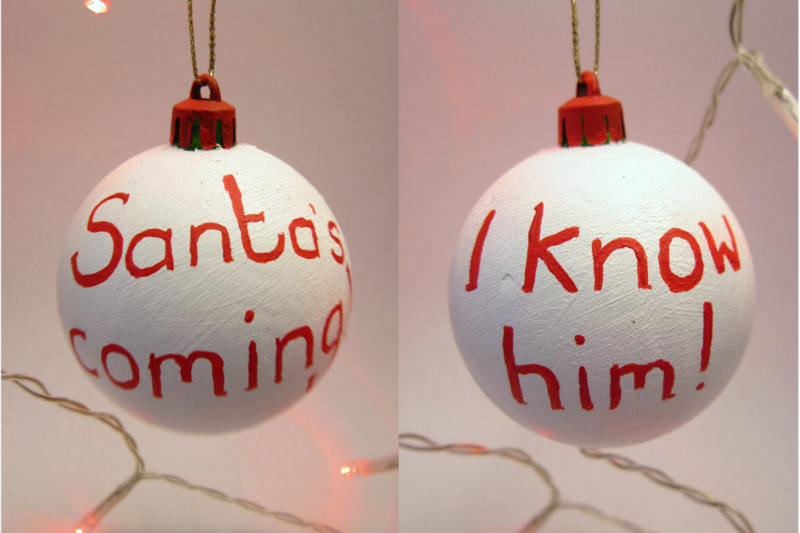 Do you have any Christmas decorations that aren't the traditional red, green or gold? In this photo I posted about the Christmas Craft Fair I did the weekend before last you may have noticed the little stockings I had for sale. They came about after a trip to, yes, the Scrap Store where my Mum bought this bag of Christmas coloured felt pieces for £2.00. I think I owe her £2.00. 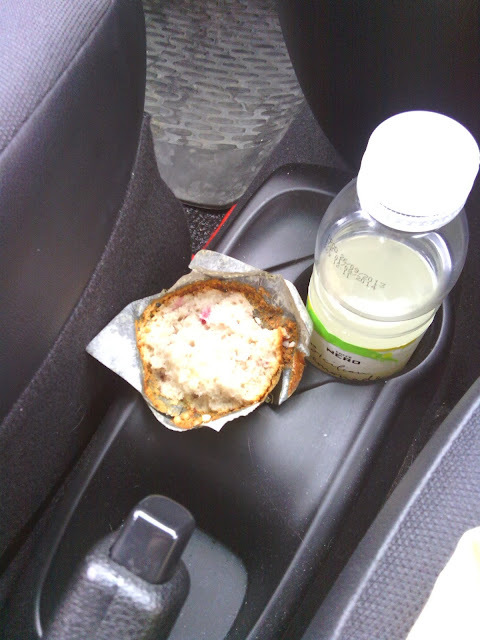 On the drive home we came up with the idea of making little stockings to sell. I printed a stocking template of the internet, cut out the pieces and stitched away. I decorated the stockings with shiny stars and ribbon. This particular chocolate bar is the perfect size to fit in the stockings so I stocked up on those. I made 6 stockings for that craft fair and sold 4, with one woman wanting 8 so I gave her the details of the next fair I'll be at where I'll be ready with more that enough. 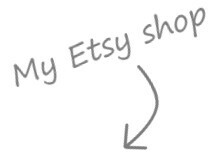 ...mostly worked and mass-produced things for upcoming craft fairs, which doesn't make for very interesting photos. I did however receive some interesting deliveries in the post which I'll share with you. I'll start by saying that I wasn't sponsored or anything by the companies mentioned - I wish, right! - I'm just a regular customer. The first thing was these new business cards I ordered from Vistaprint. I only have business cards with a photo of one of my miniatures on so I thought it was about time to get some with a painting on. Since my Beach Feet painting was so popular at the recent exhibition it was in I chose that image for the cards. Vistaprint had a great deal on where I got 250 business cards for something like £14, and free delivery. They even threw in a free business card holder. They do try to sell you more things at every stage of the checkout process which can get annoying, as do the many emails after purchase with more offers and things to buy, but it's worth it to get the great deal. I also got some greeting cards printed with three of my paintings on. This one, this one and this one. I looked around on a few different photo sites and found that Photobox had the best deal as they had a 3 for 3 offer on card packs. This meant I got 3 packs of 10 A6 size cards, for about £23, and that includes the delivery. They also come with envelopes which is incredibly useful as I don't have to worry about finding envelopes to match the size of the cards. And the images came out really well on the glossy card. Anyone making their own merch? This post is more to share an idea than a finished product. Because the finished product didn't turn out too great...but I still like the idea! Having made gingerbread men ornaments I thought a gingerbread house ornament would be fun, and you know how I like making miniature buildings. I made some simple houses out of card and put a loop of gold thread between the roof so that they could hang. I painted the houses with acrylic paint. The colour may have been the first mistake. It looks maybe a bit too orange for gingerbread. For the icing/frosting detail I wanted something three-dimensional to replicate the real stuff. I found this big tube of filler for 99p and thought it might be perfect for the job. My Mum made me a piping bag out of greaseproof paper and I squeeze some of the filler in. The piping in this photo isn't too bad, but other areas were a hot mess. My piping skills aren't that bad - see last years actual gingerbread house - but the filler is thicker than icing and doesn't flow as well. I think the cardboard is too flat/lacking texture compared the filler which is maybe too big for the scale of the houses. Any ideas for alternative ways to do this? Or any other uses for the filler now that I have a whole tube of it? My latest painting is another that comes from the beach trip I took with my friends at the end of August. It's also becoming a tradition to create a painting on a narrow canvas of myself at the beach. See here. I like less traditionally shaped canvases as they allow my to play around with cropping and create a different composition to the original photo. I started the week with a trip to the Scrap Store. I picked up a lot of fabric and zips, and also some wooden bag handles which I'm hoping to use soon. On Saturday I did my first craft fair of the season. It went really well. 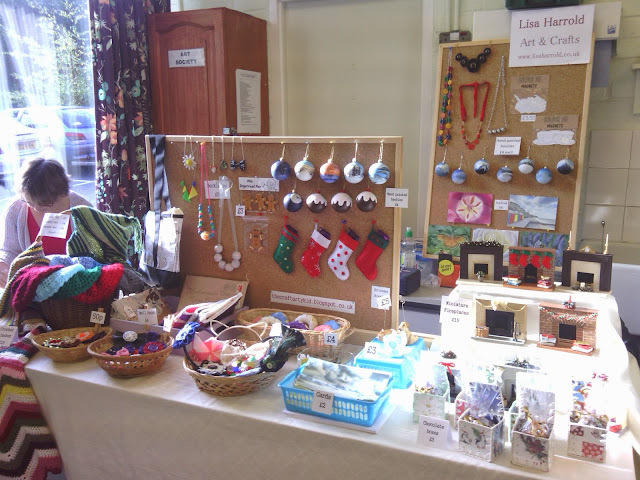 The venue had three rooms full of stalls and although I wasn't in the main room, I was in the warmest room! And on Saturday evening I went to see some fireworks with my friends. There was lots of 'ohhh'ing and 'awww'ing.